In a normal knee, the end of the thigh bone , top of the shin bone and kneecap are covered in a smooth and very slightly spongy lining called ' articular cartilage '. This allows the thigh, shin and kneecap to move freely with each other with minimal friction and most importantly no pain. However, injuries to the knee can result in localised damage to this smooth lining, leaving areas where the underlying bone is exposed. These localised areas of damage cause pain and swelling in the knee, especially during any form of activity. The simplest way to confirm that a patient's pain is caused by damage to the lining of the knee is to perform a MRI scan. This type of scan involves lying with the lower half of your body in a special magnetic tube for approximately 20 minutes. This will easily identify the size and location of the damage (see fig 1). One method of replacing the damaged smooth lining is by a technique called 'Microfracture'. 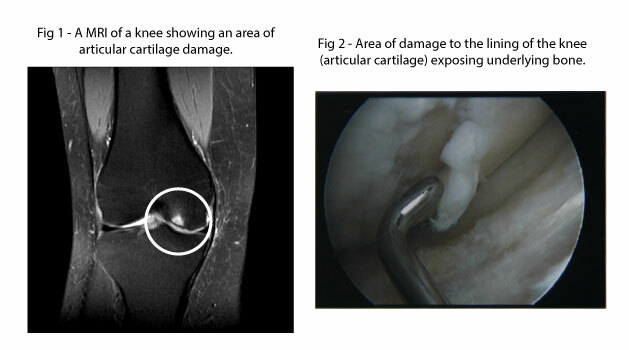 This involves looking inside the knee with a camera (arthroscopy). The damaged area can then be identified (see fig 2). Using special instruments this area is cleaned to show the underlying bone (see fig 3). Small sharp picks are then gently hammered into the bone to create a 'pepper pot' appearance (see fig 4). These holes allow the bone to bleed and form a small blood clot in the defect. 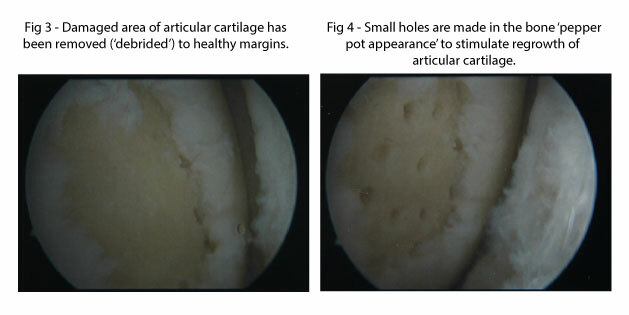 The clot contains all the required ingredients to allow the smooth articular cartilage to re-grow. After surgery, patients' are advised to mobilise with crutches for three weeks after which they can start walking normally. It normally takes approximately three months for patients to fully recover from this procedure and become symptom free.